What new costumes are available this year? 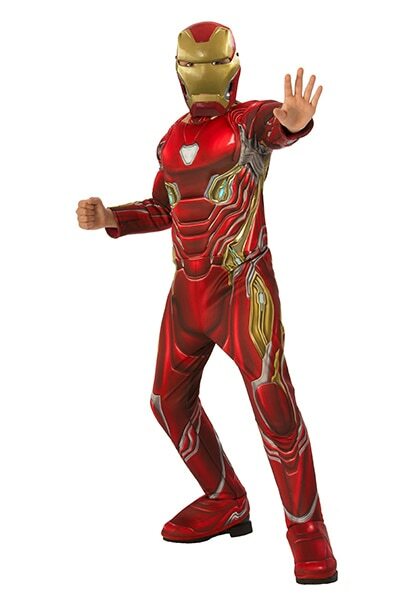 For all ages, look for Avengers Infinity War characters such as the Hulk, Iron Man, Captain America, Thor and other costumes from the hit movie to be sought-after this year. Black Panther costumes and masks are expected to dominate sales for Halloween 2018, while Incredibles 2 costumes are great group costume ideas for families and friends. How can I find Halloween Express stores near me? Visit HalloweenExpress.com and click on the Find a Store link to look for locations in your area or in other areas. What else does the Halloween store carry? Besides costumes, masks, accessories and props, you’ll find decorations, balloons, pumpkin carving kits, fog machines, mummies, haunted house props and more. Halloween Express animatronics range from small scary cats and moving books to larger tombstones, reapers, witches and zombies – so you’re sure to have a great selection of Halloween decorations for inside and outside the house. When is Halloween? This year, Halloween 2018 occurs on Wednesday, October 31. Parties and costume contests are expected to primarily be held the weekend before. Does Halloween Express carry couples costumes? They have great Halloween costume ideas for couples! Dress up as your favorite superhero duo, a superhero and arch villain, or choose from a selection of costumes designed exclusively for pairs. Many of them are great for friends to dress up together, too! Get free shipping on orders of $75 or more. Pay no delivery fees when your order totals $75 or higher. For orders that don’t meet the minimum purchase to qualify for free shipping, check Valpak.com for a coupon code to avoid shipping costs. Save with the 110% price guarantee. HalloweenExpress.com will refund the difference plus an extra 10% if you find the same item on a competitor’s website for a lower price. Learn more about the price-matching policy online. Have a Halloween Express store near you? Buy online and pick up in store to get it quick, even if they don't have your merchandise in stock. You'll also avoid shipping charges, in most cases. FREE exchanges within 15 days of delivery. Take advantage of their free exchange program if you’ve ordered the wrong size or need a different style. You have up to fifteen days to exchange merchandise from the date you receive it, and they’ll pay for the shipping both ways! Visit their website for details on their free and easy 4-step exchange program. No code needed, some exclusions may apply, see site for more details. Includes Free Shipping. Click this link and shop on new 2018 costumes for kids. Shipping is free on orders over $75. Restrictions may apply. No code needed, some exclusions may apply, see store for more information. Includes Free Shipping. Click this link and shop on all products. Shipping is free on orders over $75. Restrictions may apply.